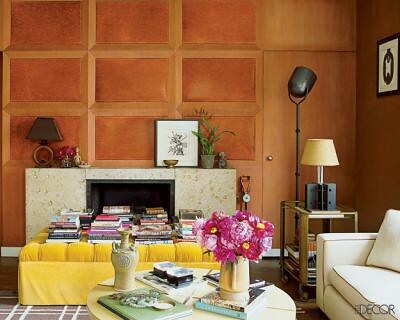 Nate Berkus's living room, featured in Elle Decor, upload feito originalmente por xJavierx. Decorator Nate Berkus updated his historic Chicago , home’s original oak-paneled walls with handsome leather inserts; a custom-made ottoman upholstered in a cheery Clarence House cotton velvet lends a colorful note in front of the coquina fireplace. Photo by Pieter Estersohn, Elle Décor, March 2009.